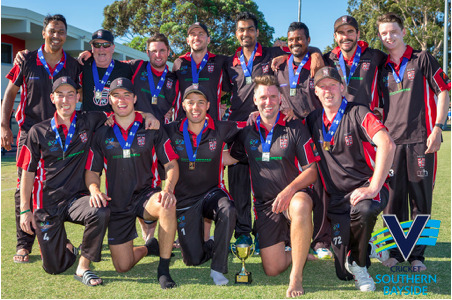 On a perfect day weather wise, the CSB White Ball finals were held across seven divisions on Sunday 4th February. From Championship through Division 1 to Division 6, the top two places in the white ball ladder (results of One Day and T20 matches) played off for the White Ball Premiership. In the Championship, it was a replay of last season with South Caulfield taking on Bonbeach in what ended up being a cracker of a game. Bonbeach were sent in by South’s and that strategy paid off quickly as Bonbeach found themselves at 3/19, where Tom Smith and David Fernandez set about steading the ship before Smith (36) was out with the score at 80. Fernandez (63) continued on, only to be dismissed with the score at 7/163 and Bonnie making 8/183 from their 40 overs, Sampath Perera 4/44 leading the South attack. The total looking to be short of a competitive score against South’s on their home deck. Dan Mueller stirred up the Bonbeach crowd by grabbing the wicket of South’s captain Luke Russell (4) in the first over, but then young Elliot Bradley (35) and Lewis Mildenhall (52) set out in pursuit of the 184 required. At 3/110, Bonbeach looked to have turned the game with Player of the Match, Tom Smith (5/27) stepping in with the ball, reducing South to 5/119, then followed another Smith wicket and run-out and it was 7/153. With 2 overs to go it was 12 balls, 12 runs, as Johnno Curtis (26*) and Kanishka Alvitigala (11*), set about finalising a win. Curtis, amongst a last over run-out chance was also dropped when a sharp catch went down, but managed 2 runs for it. In the end it was Curtis and Alvitigala getting South over the line with 2 balls to spare.